Reduction of turning and tossing during sleep. Encouragement of proper support and alignment of the back. Minimize impact of movement from bed partner. Promotion of balanced sleep temperature. Resistance to edge roll-off and sagging. Families affected by drowsiness during driving. To be considered the “official” mattress by the NSF is both a privilege and an honor for Serta’s Perfect Sleeper mattress series. Every purchase of a Serta Perfect Sleeper, including the Lockland Super Pillow Top Mattress Hybrid Gel Innerspring, comes with the NSF’s Guide to Sleeping Well, an informative booklet that contains numerous suggestions, resources, and tips to get optimal results from your use of the mattress. Considered to be one of the leading mattress brands in the world, Serta’s attention to details in technologies for mattresses has made it innovate many scientific discoveries to help improve their own products such as memory foam mattresses that easily conform to the body contours of the users regardless of the types of sleepers they are. The Serta Lockland, for instance, is ideal for back, side or stomach sleepers. This mattress features the Lockland Super Pillow Top which is manufactured using advanced bed mattress technology. 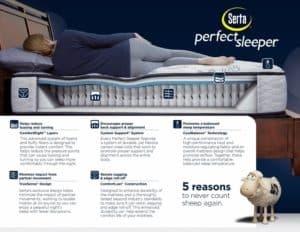 The user gets a unique experience that is guaranteed to improve sleep quality as a result of Serta’s combination of memory foams – including the Serta Pillowsoft Foam and Comfort XD Foam – and “cool twist” gel memory foam to provide flexible support for its system of 704 coils. The mattress, designed and manufactured entirely in the U.S.A., has an additional layer at its surface as upholstery for improved cushioning as well as enhanced softness for the user’s luxurious comfort during sleep. Serta mattresses, including the Perfect Sleeper Lockland, are free from lead, CFCs, flame retardant-PBDAs, prohibited phthalates, mercury, and other potentially hazardous materials. The Comfort XD Foam material in the Lockland cradles the user’s body gently using its extra deep layer of soft foam to provide relief from pressure points. 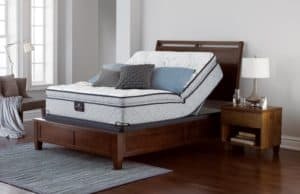 Additionally, this gel memory foam mattress, enhanced by a gel exclusively made for Serta, can move heat or warmth away from the body to promote a balance in the user’s temperature even during sleep. California King: width is 72 inches, length is 84 inches, and 110 is its weight in pounds. King: width is 72 inches, length is 80 inches, and 110 is its weight in pounds. Queen: width is 60 inches, length is 80 inches, and 100 is its weight in pounds. Full: width is 54 inches, length is 75 inches, and 60 is its weight in pounds. Twin: width is 38 inches, length is 75 inches, and 40 is its weight in pounds. The Lockland mattress is compatible with an adjustable bed; moreover, it offers the user the option to purchase a box spring for even more enhanced lift. The mattress comes with a quilt equipped with an inch of Fireblocker Fiber Pillo-Fill Serta Pillowsoft Foam for its top upholstery as well as a ¾ inch Serta Comfort XD Foam and a half Cool Twist Gel Memory Foam Serta Insulator Pad as part of its customized, flexible system. It seems that the firmness of the Serta Perfect Sleeper Lockland Super Pillow Top Mattress Hybrid Gel Innerspring is dependent on who uses it. Some Amazon customers wrote reviews that indicated the mattress is not firm enough for their particular needs while others found it on the soft side, albeit still comfortable for use in the guest bedroom. Customers of other online vendors are also divided on their verdict as to whether or not the Serta Perfect Sleeper Lockland Super Pillow Top Mattress Hybrid Gel Innerspring may be considered a firm, very firm or semi-firm mattress. If there is one thing that everybody agrees on, though, it is the Lockland’s stable foundation base and reliable V-shaped design and construction. Serta offers buyers of the Lockland mattress a warranty of ten years on it provided that the law, or legal, tag found at the end of the mattress is not torn off. This legal tag contains crucial information about the manufacture of the mattress which you will be required to supply in case you make a warranty claim. Check out Serta’s official website to learn more about its product’s warranty and registration. Additionally, potential customers will be glad to know and appreciate the fact that Serta mattresses are manufactured in facilities that have been certified compliant by the Consumer Product Safety Improvement Act (CPSIA). This means that Serta products have undergone the most rigorous of tests to meet new acceptable levels required by the CPSIA from manufacturers of apparel, jewelry, bedding, books, etc. Based on 15 Amazon reviews, 60% of customers gave the Serta Perfect Sleeper Lockland Super Pillow Top Mattress Hybrid Gel Innerspring five stars out of five to obtain an overall rating of 4.5 stars out of five. It should be mentioned, however, that 20% of these customers gave the product only one star due to different reasons stated as cons in their reviews. There is no substitute for good, regular sleep every night because everybody deserves to his/her share of rest and relaxation without stress or interruption. As mentioned earlier, poor quality sleep – including sleep deprivation – can eventually lead to medical conditions that could be avoided by investing in quality bedroom furniture including a mattress that ensures you sleep comfortably and without the risk of future deformity. 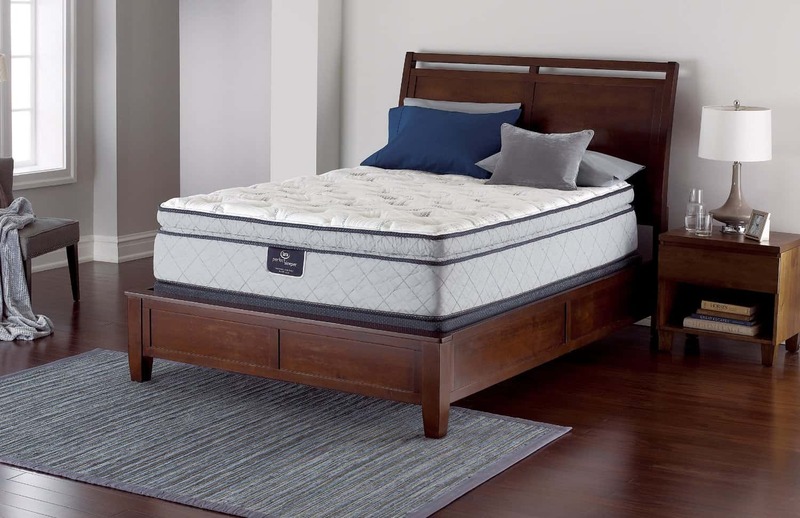 The Serta Perfect Sleeper Lockland Super Pillow Top Mattress Hybrid Gel Innerspring is one of those mattresses that you can depend on for reliable performance night after night after night. While most people may find the price intimidating, consider it as a long term investment that can significantly improve your sleep, or get rid of your sleep issues, and help maintain your health for longer. If you are the kind of shopper who makes a purchase decision based, in part, on what other shoppers have already experienced with the product, you may want to read up on the customer reviews of the Serta Perfect Sleeper Lockland Super Pillow Top Mattress Hybrid Gel Innerspring not only on the official Amazon website but on other third party websites as well to get unbiased observations. Should you buy the Serta Perfect Sleeper Lockland Super Pillow Top Mattress Hybrid Gel Innerspring based solely on customer reviews? As in all things, the proof of the pudding is always confirmed after it has been eaten. Experiencing the benefits of the Lockland will require that you purchase the mattress and try it on for size. While the price tag is not exactly cheap, remember that you are paying for an investment, not just an item.